I’m sure that like many of you, when the weather starts getting colder, chili starts popping up on the menu. Now don’t get me wrong, I LOVE chili, but have you ever made TOO much chili? I don’t mind eating chili a few days in a row. Sometimes, we turn it into Frito pie or chili dogs or even make cheese enchiladas out of it. But the other week we were looking for something different. Something a bit out of the norm for us and this is what we came up with. 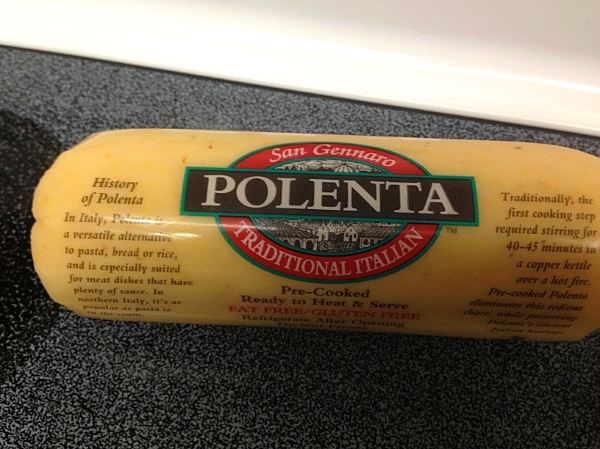 I’m sure if you had the time and energy, you coul dmake your own polenta, but this works well enough. Melt the butter over medium high in a skillet. Add the corn and cook for 5-6 minutes. Add the green onions and cook for an additional minute. 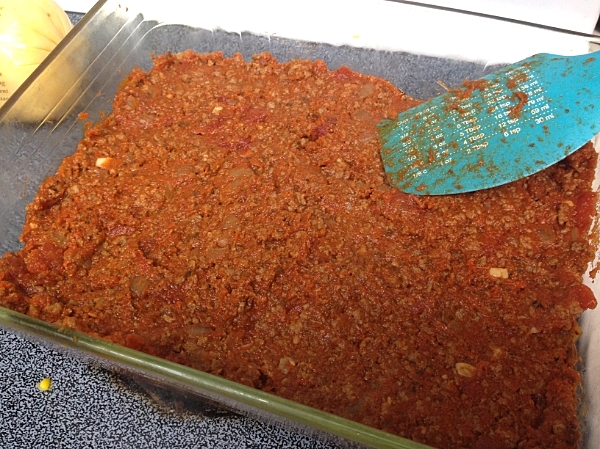 Top the chili with the corn and onion mixture and sprinkle on half the cheese. Cut the polenta into 12 discs. I usually cut the rounded ends off and save for later. Layer the polenta on top of the cheese, overlapping slightly if necessary. Top the polenta with the remaining cheese. 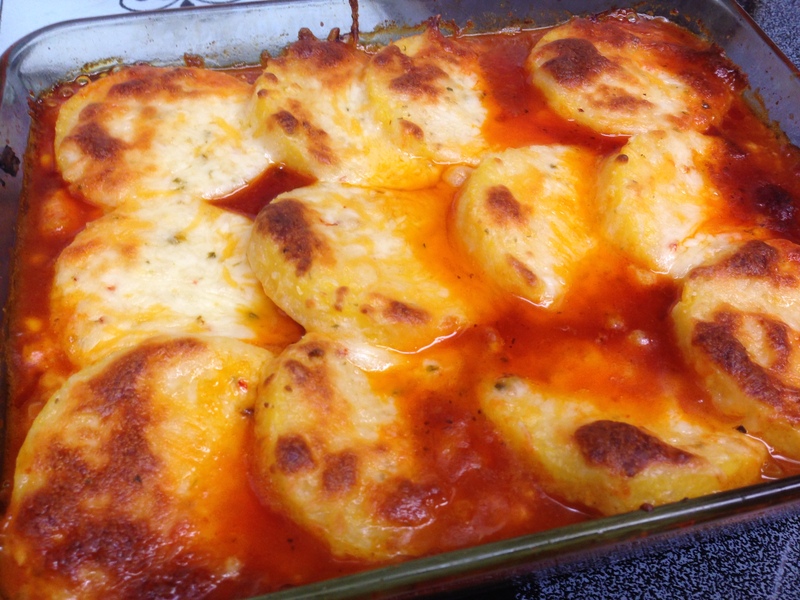 Bake the casserole for 20-25 minutes, or until heated through and the cheese has turned a golden brown. Allow to sit 5 minutes before serving. 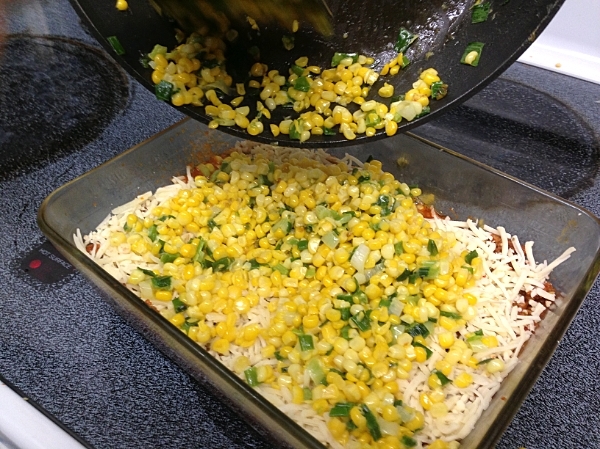 Add the half the cheese and then top with the corn and green onion mixture. How do you cut the polenta equally? Easy. Cut off the two rounded ends first, these can be saved for something else or tossed. Then cut the polenta in half. Take one half and cut that in half. Take that half and cut in thirds. Repeat with the rest of the polenta. Or just eyeball it. It’s not rocket science. It doesn’t matter if they are perfect. Lord knows mine weren’t. 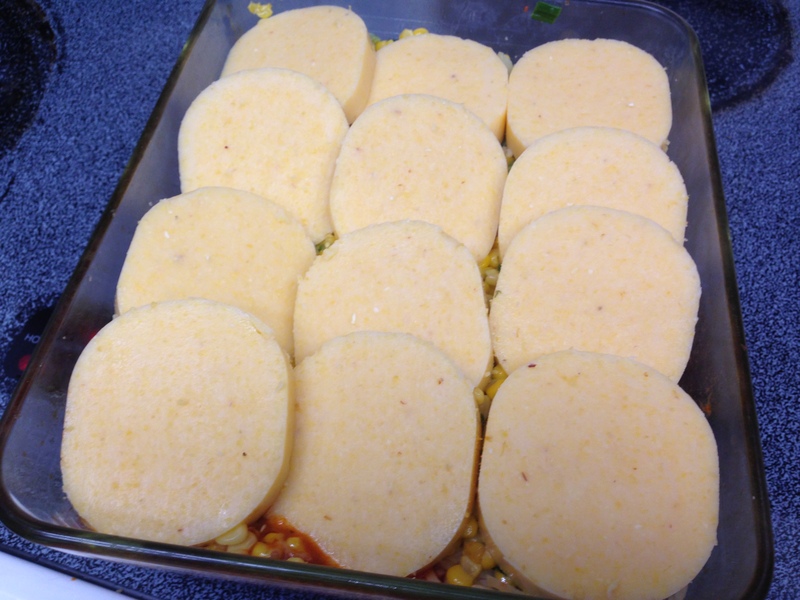 Layer the polenta on top of the corn mixture, overlapping if necessary. Top the casserole with the remaining cheese and bake at 450F for 20-25 minutes or until heated through and the cheese is a golden brown. Mmmm…look at all that cheesy topped goodness. Bet you wish you had smell-a-vision. Now, the hard part. Wait. I know, I know. You want to dig right in. But just like any good casserole, you should wait at least 5 minutes, 10 would be better, before trying to serve it up. Give it a chance to cool down a little bit and firm up. Otherwise, you are going to have a mess on your hands. Good things come to those who wait. Not the best picture, but honestly I wasn’t sure if we were going to share this. Mrs. G took one bite and all she could say was, “WOW! 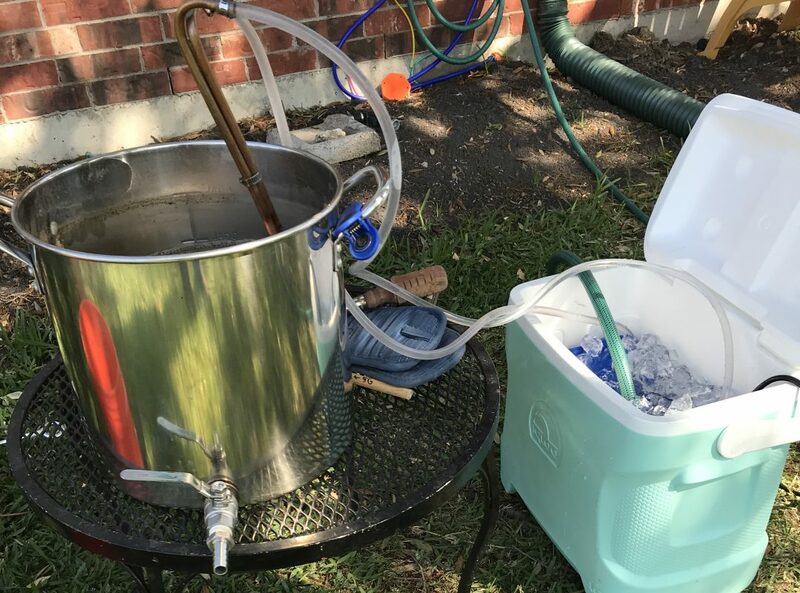 !” I tried it and immediately knew I was going to share it with you guys. And then immediately felt bad that I didn’t take better pictures to present it better. 😦 I just didn’t think it was going to be that good. The polenta really added another layer of flavor and texture to the whole dish. Honestly, I thought it was going to be ok, but not that good. Granted, all that is really dependent on how good your chili is. If you have bad chili to start with, your casserole is going to be bad. Sorry, I can’t share our chili recipe with you. I’d love to say our chili recipe a closely guarded family secret and that if I told you I’d have to kill you and all that. Actually, all I have is a battered piece of paper that has a list of ingredients that go into it. It doesn’t even have any amounts written down. I just kind of eyeball it and every time it comes out a little different. The only advice I can give you is make sure you have a pretty thick chili, not a watery, soupy one or when you bake it, the polenta will sink and get soggy and that wouldn’t be bueno. Next time you make too much chili and you are trying to figure out what to do with it all, try this casserole for a nice change of pace. Nice way to repurpose a batch of chili. I know you’re from Texas and all, but even so, there should be beans in this! Naw, it looks delicious, man. Love the idea. 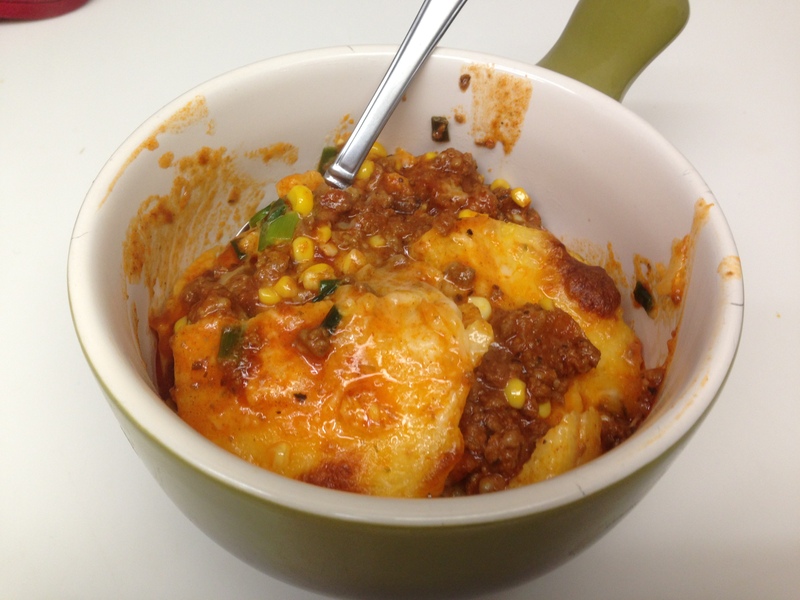 Another way to re-purpose chili left overs! griff, i love ya … looks like what they say ’bout great minds thinkin’ alike is true! 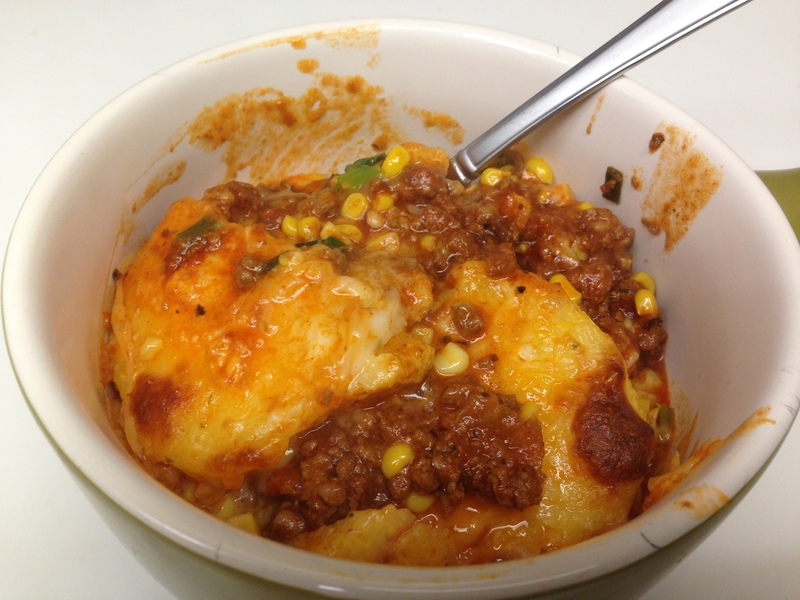 been baking chili (leftovers) forever … rice instead of polenta – but baked nonetheless! here’s my version, my favourite chili! great blogpost!! Auctions to give this a try, as soon as I figure out how to make too much chili. Holy smokes, I’m inspired….and I have leftover chili. So tomorrow, chili and grits it is!